1660: An informal group of “natural philosophers” establish what will become the Royal Society, Britain’s foremost scientific academy. The society, founded to support excellence in the physical sciences, began as a group of like-minded men who met weekly to conduct experiments and discuss the scientific issues of the day. 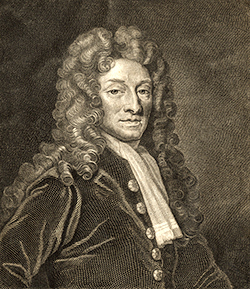 The founding members included the cream of Britain’s intellectual and scientific elite: Christopher Wren, Robert Boyle, Sir Robert Moray, John Wilkins. The founding took place at Gresham College, following a lecture by Wren. A royal charter was issued to the Society in 1663, naming King Charles II as founder and establishing the formal name as The Royal Society of London for Promoting Natural Knowledge. Over the centuries, the Royal Society has evolved from an association of “gentlemen scientists” to an academy of professionals. From the beginning, the Society elected its Fellows but the rules for admission remained vague until 1847, when it was agreed that future Fellows would be elected solely on the merit of their scientific work. A British government grant in 1860 helped seed the society, which ever since has been active in funding everything from research to education to expeditions of discovery. Although it has no formal ties to the government, the Royal Society is Britain’s de facto academy of sciences and receives 47 million pounds [$75 million] annually from the treasury. Among past and present Fellows of the Royal Society, giving them the right to append the suffix FRS (Fellow of the Royal Society) beside their names: Isaac Newton, Charles Darwin, Benjamin Franklin, Ernest Rutherford, Albert Einstein, Dorothy Hodgkin, Francis Crick, James Watson and Stephen Hawking. There are more than 80 Nobel laureates among the society’s current membership of approximately 1,500 fellows and foreign members. This article first appeared on Wired.com Nov. 28, 2007.